Fuel cell vehicles: The only cars with potable exhaust? The bare chassis of Toyota's new hydrogen fuel-cell sedan -- the Mirai. TOKYO -- Toyota Motor Corp. pitches its new Mirai hydrogen fuel cell car as a godsend for the planet. Heat and water are its only byproducts, not climate-altering carbon dioxide. But just how clean is that exhaust water vapor? After all, there is artesian spring, pristine mountain stream water. Then there’s bottom-of-the-barrel Love Canal water. Turns out, the Mirai’s exhaust water is safer than milk, Toyota says. Still, the company doesn’t recommend drinking it. That’s because the water is created by sucking in oxygen from the surrounding air and bonding it to hydrogen from the fuel tank. “Depending on the place you are driving, some parts of the world might have certain issues, such as organisms like E. coli, which could be hazardous to your health,” Mizuno said. “You never know what the quality of the air intake is,” he added. Despite the stack’s high-tech chemical process, it neither sterilizes nor distills the water. Yet in most cases, teetotaling would be an abundance of caution, engineers said. Indeed, astronauts have generated their own drinking water from fuel cells since the days of the Apollo missions, said Yasuhiro Nonobe, general manager of the Mirai’s overall fuel cell system. There also don’t seem to be issues with metals or other chemicals from the drivetrain itself leaching into the water. Only in extreme cases might some chemicals bond to the fuel cell’s catalyst and leach into the exhaust vapor, Nonobe reckoned. Case in point: Sulfur discharged during a large volcanic eruption might cling to the catalyst. “But we’re talking about a massive amount of sulfur,” Nonobe said. 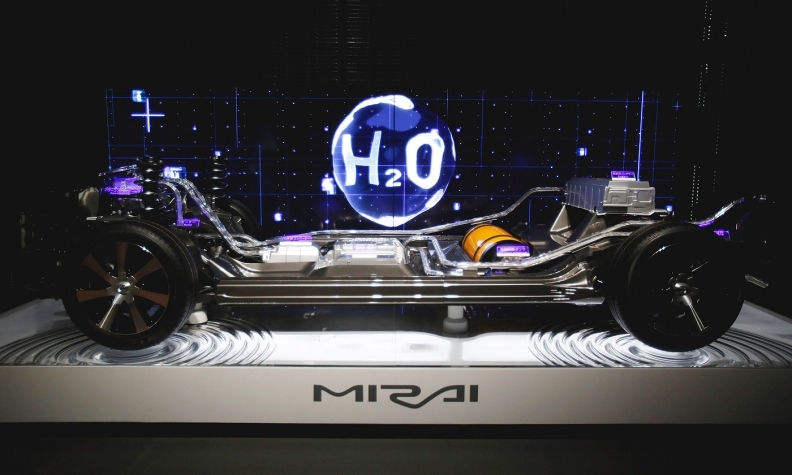 The Mirai emits 37 liters (10 gallons) of water if driven its maximum range of 650 kilometers (404 miles). That is 0.05 liters per kilometer (0.08 liters per mile, 0.02 gallons per mile). It might be tempting to think of these cars as rolling steam baths. Imagine sitting in a traffic jam of these vapor-emitting cars on a humid summer day in a place like Atlanta. But in reality, conventional gasoline engines emit just as much water vapor in their exhaust, Nonobe said. So there would be little net change to the overall amount of water released into the atmosphere from a wholesale switch to hydrogen from gasoline, he said. And the vapor from a gasoline engine is much hotter. That’s because the typical combustion engine operates at a higher temperature than the fuel stack. An Iwatani employee holds a fuel dispenser nozzle as he prepares to fill the Toyota Mirai with compressed hydrogen from a smart hydrogen fueling station in Tokyo this week. 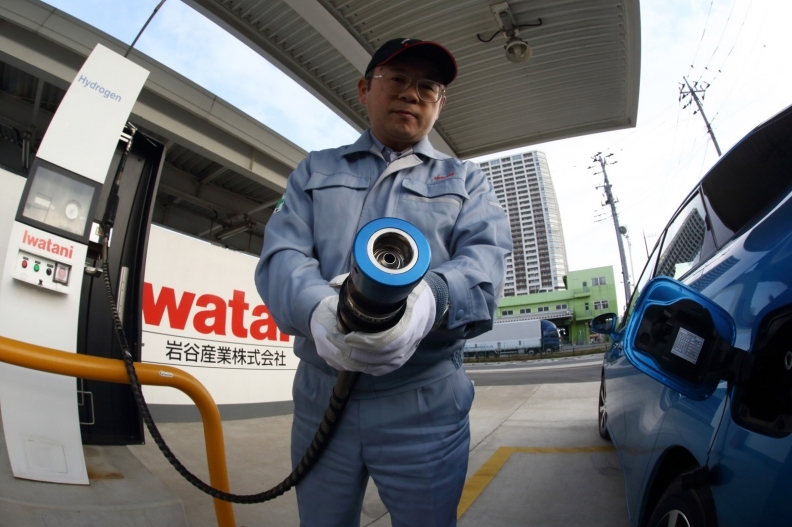 An Iwatani Corp. employee holds a fuel dispenser nozzle as he prepares to fill a Toyota Motor Corp. Mirai fuel-cell powered vehicle with compressed hydrogen from a smart hydrogen fueling station in this photograph taken with a fish-eye lens in Tokyo, Japan, on Monday, Nov. 17, 2014. Vapor from a combustion engine’s exhaust pipe comes out at around 150 degrees Celsius (302 degrees Fahrenheit). When it wafts from the drainage hole of the Mirai, it’s a more manageable 60 C (140 F). Indeed, the water dripping out of the car after a short Tokyo test drive was cool to the touch. Still, Toyota has engineered a few tweaks unique to the fuel cell’s water exhaust system. Push this, and it blasts condensed water out of the exhaust system. That’s so you don’t pull into your garage and have the water drain out later all over the floor. Usually, it would be just a little puddle. But depending on the air temperature and how long you’ve driven, it could dump as much as 2 or 3 liters, Nonobe said. Indeed the exhaust pipe itself is unique. There is no need for a clunky exhaust system with mufflers, catalytic converters and such. So it was easy for engineers to clamp on a smooth underbody to the car, thereby improving overall aerodynamics. At the rear, there is a small aperture, almost like a nostril, punctuating the underbody. It faces downward toward the road, flush with the body, not backward like on regular cars. This drainage hole is where the vapor comes out. 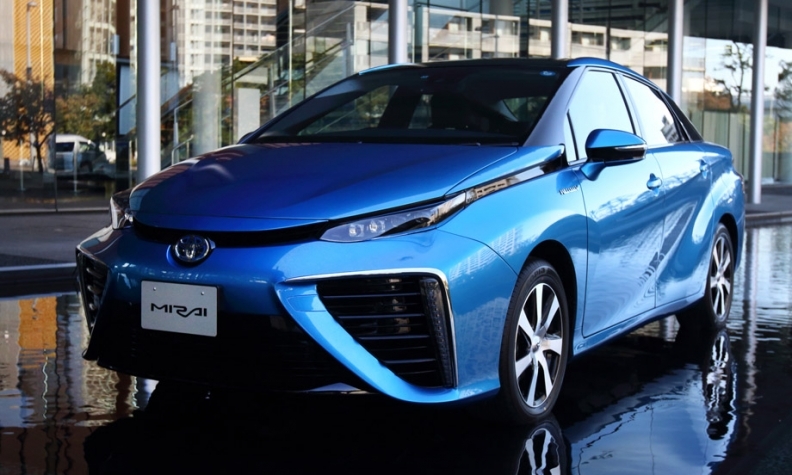 The Mirai emits 10 gallons of water if driven its maximum range of 404 miles. That is 0.02 gallons per mile. Toyota also sells the Mirai as an emergency electricity source because the fuel cell generates power that could run a house in case of a blackout. Japan is particularly receptive to such arguments after the 2011 earthquake and tsunami left parts of the country in the dark. But could the car also provide an emergency water source when the pipes are broken or the water pump is down? Or even a recycling source for arid countries such as Saudi Arabia? Still, if you were daring or desperate enough, what would the water taste like to drink? Nonobe said no one at Toyota has tried. But the water is slightly acidic with a pH around 5 or 6. That’s less acidic than acid rain and even beer -- but still just tangier than good old milk. Hydrogen cars are here. Is the world ready for them?